Bvlgari Mon Jasmin Noir L'Eau Exquise inspired by the beautiful Italian gardens. Bvlgari Mon Jasmin Noir L'Eau Exquise 75ml. Eau De Toilette is a very subtle fragrance for women. It is based on refreshing tones of fruits, flowers, tea and woody end. Mon Jasmin Noir fragrance L'Eau Exquise is suitable for the warmer months of spring and summer. Remarkable delicacy and gentleness fits all women who are in total agreement with the motto: ˮ Simplicity is beauty! ˮ. Bvlgari perfume created by famous brand is specifically designed for day and perfect in every moment of life. 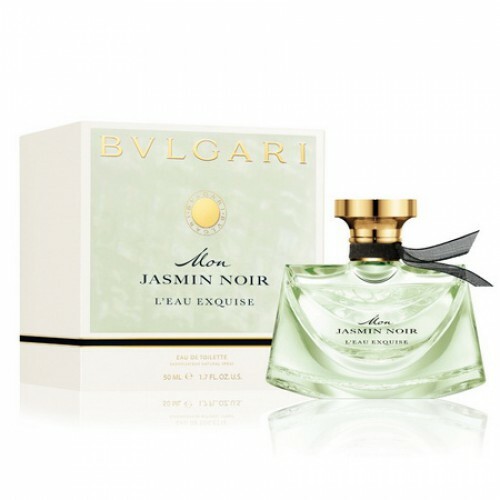 Lovely bottle of perfume Jasmin Noir L'Eau Mon Exquise will decorate a shelf absolutely wonderful your cosmetics . Its unusual shape, bright green liquid inside, and golden cap evokes charm, youthfulness and elegance. Square boxes, minimalist style, which protects against damage perfume suggests purity, freshness and simplicity of the whole composition. Bvlgari Jasmin Noir collection has expanded with a new song. Mon Jasmin Noir L'Eau Exquise is like a warm spring breeze, without being too sweet or ostentatious. Top notes are marked by an interesting aroma of oranges, grapefruit and delicate almonds. The inviting essence of tea in a perfect mix of sensual jasmine petals, which gives the whole composition a refined flavor. Finally, you will be delighted by the agreements woody musk owned totally. Mon Jasmin Noir fragrance L'Eau Exquise is a medium power. Famous jewelry brand, Bvlgari, also offers luxury perfumes for both women and men. Express the quality and beauty, combined with a refined design of the bottle, features that are at the origin of the brand Bvlgari. Spoil yourself with this fragrance made like to order. Bvlgari offers an extremely wide range of wood, suitable for those who love elegance, sensuality and freshness. For them they have good taste and own sense of beauty.